Police are still waiting to speak to the driver of a coach that crashed and landed on its side on a motorway services slip road on Monday. The driver from West Bromwich, West Midlands, was seriously injured in the crash at Newport Pagnell services and is in Northampton General Hospital. It is hoped the slip road can be re-opened now the road surface damaged by a diesel spillage has been repaired. Police have carried out a detailed investigation of the crash scene. Richard Bowker of National Express, operators of the coach from Birmingham to Stansted Airport, said the firm was fully co-operating with police investigating the crash, which left 30 people injured, six seriously. The 34-year-old driver has been arrested on suspicion of drink-driving and is under police guard in hospital while detectives wait until he is fit enough to speak to them. Thirty people were injured and Mr Bowker said his drivers were subject to tests to ensure they met high standards and were tested randomly for drink and drugs. He said: "To be even considered to drive for National Express you have to pass very rigorous tests and the recruitment test, particularly around drugs and alcohol, is very tough. "Once you are driving for National Express then the standards to which you have to perform are higher in terms of drink than the legal requirement. "We randomly test and that means that it is extremely likely that you will be caught at some point." The single-decker coach clipped a kerb, hit a lamppost and a tree and toppled over on to the driver's side in the accident. 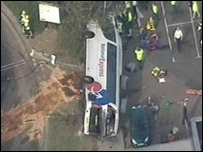 The six with serious injuries were taken to hospitals in Milton Keynes, Northampton and Oxford. The driver, who had to be cut free from the wreckage, was breath-tested at the scene and is being treated for an injured arm and cracked ribs. Three of his passengers are still being treated at Northampton hospital. They are a woman, 45, from Church Stretton, Shropshire; a man, 60, from Goussanoville in France and a man, 28, from Coventry. A woman, 57, from Victoria, Australia, and a man, 20, from Gdansk, Poland, are being treated at Milton Keynes General Hospital. A further two passengers - a woman, 39, from Worcester and a man, 61, from Kenilworth, Warwickshire, are being treated at the John Radcliffe Hospital in Oxford.